The more we look, the more we find potentially toxic microplastics—the tiny bits of debris that our plastic products crumble into—everywhere in the environment, the surrounding wildlife, and even our food and beer. So perhaps it shouldn’t come as a surprise that new research released this week suggests that microplastics can end up in our poop. But it’s still unclear just how seriously we should take this discovery. Research into the environmental and animal health effects of microplastics, defined as any fragment of plastic smaller than 5 millimeters, is still developing. But the early findings aren’t exactly reassuring. It’s been shown that the ingestion of these plastics can make it harder for fish and other marine life to feed normally and may even shorten their lives. They can also expose animals to a wide assortment of chemicals that cause infertility and other hormonal issues. Some of these chemicals, such as bisphenol A (BPA), are the byproduct of the plastic breaking down, but other pollutants, such as toxic metals, get absorbed by the plastic from the environment. Eating fish probably isn’t exposing us to many microplastics, since they largely end up in the fish’s guts, which we typically don’t consume. But we are regularly exposed to the chemicals produced by plastic products, and there is some evidence that they can similarly harm our hormone production. We don’t really know how much of this exposure we can blame on microplastics, though. In the new study, scientists from the Medical University of Vienna and the Environment Agency Austria recruited a group of eight far-flung volunteers for a simple experiment. The volunteers each came from separate countries scattered throughout Europe and Asia, including Italy, Japan, the UK, and the Netherlands. Over the course of a week, the volunteers recorded what they ate. Then on the final day, they gave a stool sample that was shipped off to a lab at the Environment Agency Austria. There, the researchers say that new testing methods allowed them to look for as many as 11 different kinds of plastics. According to the researchers, nine different types of plastic could be found in the volunteers’ stool samples. The study can’t tell us for sure how they ended up with plastic in their guts, but all of the volunteers reported eating plastic-wrapped food or drinking from plastic bottles, while six reported eating seafood. “This is the first study of its kind and confirms what we have long suspected, that plastics ultimately reach the human gut,” said lead author Philipp Schwabl, a scientist in the Division of Gastroenterology and Hepatology at the Medical University of Vienna, in a statement. But the study has plenty of caveats. For one, the small sample size of eight people makes it impossible to make any strong conclusions. And rather than the findings being published in exhaustive detail in a peer-reviewed journal, they were presented this week at the annual United European Gastroenterology conference. New research is often previewed at academic conferences, but without a disclosure and independent review of the team’s methods, we can’t be sure there weren’t some inadvertent mistakes made along the way. Outside researchers have bought up the distinct possibility that the stool samples were contaminated, for instance, since the plastics they found are commonly seen in lab and testing equipment. “Poor quality observations of contamination do not represent well the scientific method and therefore in my humble opinion do not help us understand impacts [of microplastics] on humans or manage them,” Mark Browne, an expert on microplastics at the University of New South Wales, Australia, told the AP. In the brief abstract accompanying the team’s presentation, the authors note that they were only able to find microplastics in five of the eight samples so far. They claim high levels of celluose (a common carbohydrate found in fruits, vegetables, and grain) and fat in the other samples have made it hard to sift out plastic, and say they’re working on refining the testing methods. The authors concede their research is only meant to be a pilot study, and have called for more studies. 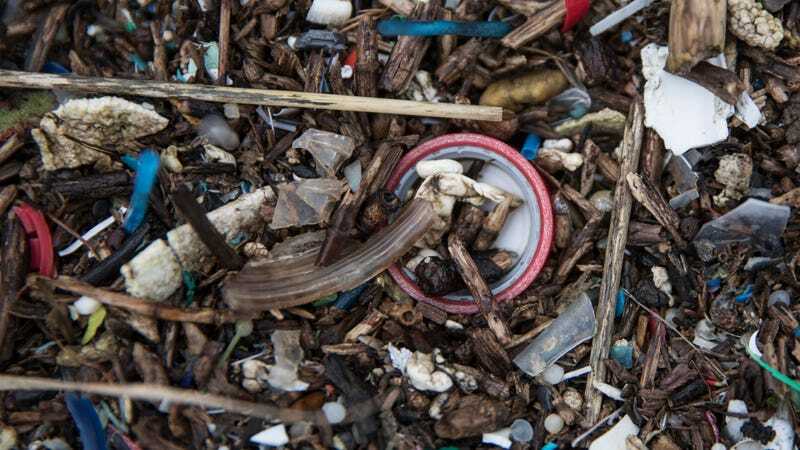 But regardless of whether microplastics in our poop turn out to be a grave concern, we already know that plastics are bad for the environment and for many animals, so it’s still something to be worried about.